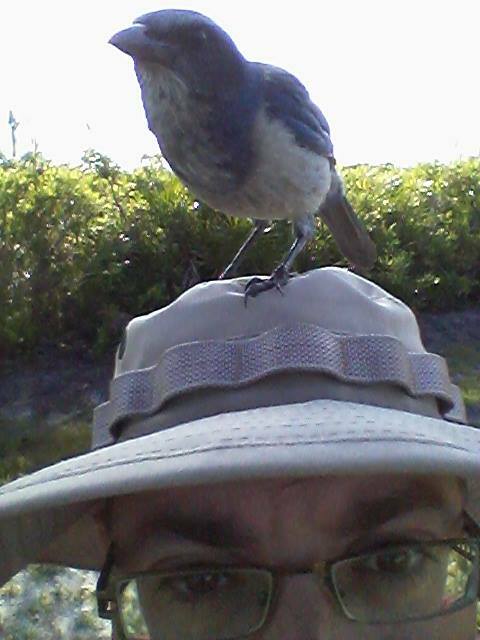 They say patience is a virtue, so you may understand that many of us birders along the Space Coast have felt seriously virtuous this Spring. It was long overdue for something more serious to happen, along with the fall-outs at the end of April (see previous blog entries). The last few weeks have seen some of the best birding around parts of the Space Coast in years, though in perhaps a different manner than one might expect. While it’s true that not all warblers migrate at the same time, it’s more typical for several species to come through an area at a time. For example, years past it was normal for Blackpoll Warbler and American Redstarts to come through Turkey Creek Sanctuary around the same time each year. This time, we seem to have gotten specific warbler days, with dozens (and in one case I’ve heard, hundreds) of one species to fall out for a couple of days, to be replaced by another after that species moved out. 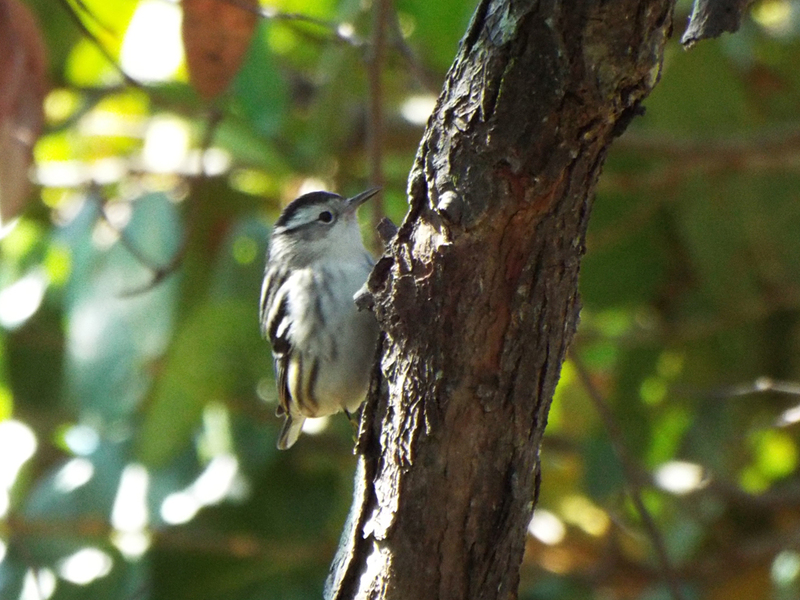 It started with a “Black-and-White Warbler Day”, in which dozens of that species were moving through most of the park. 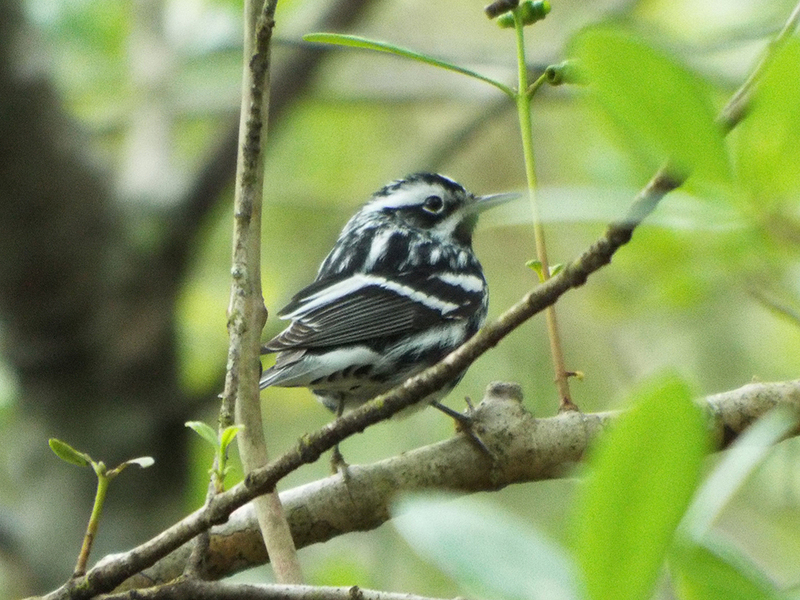 A Winter resident in Florida, the Black-and-White Warblers were fueling up on tiny insects in preparation for migration and breeding. The very next day was a “Blackpoll Warbler Day”. The Black-and-White Warblers were still numerous, but the Blackpolls outnumbered them almost 3-to-1. A Blackpoll male, showing his distinctive black cap (or “poll”) and characteristic orange legs and feet. Of course, other birds were also present, though in smaller numbers. 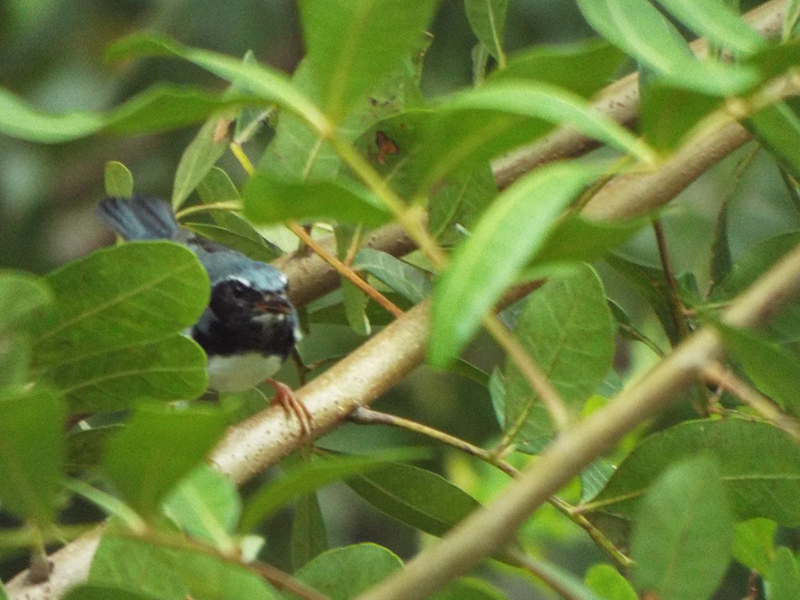 There have been steady trickles of Worm-eating, Cape May and Black-throated Blue Warblers all through these fall-outs. After a dip in activity, another weather system moved through and we had two “American Redstart Days”, where many dozen of these quite active birds were flying all through the area parks. 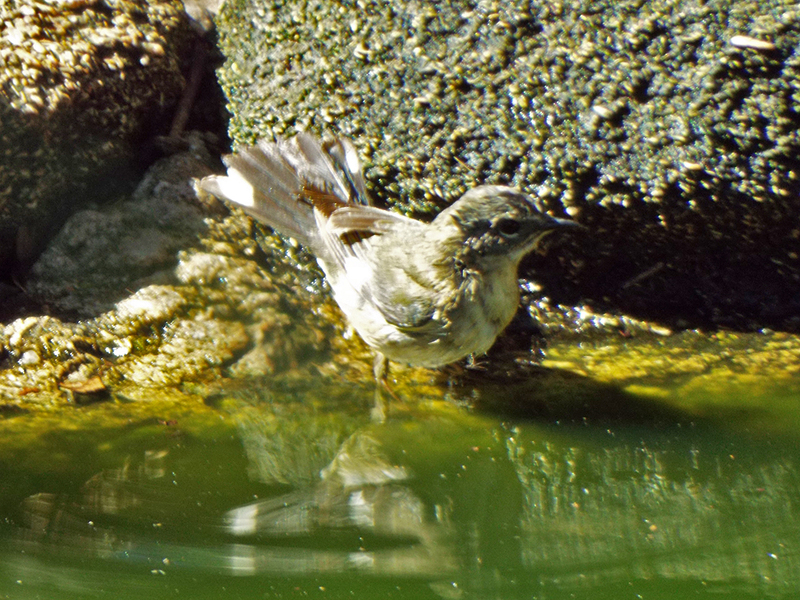 Many redstarts were first-year males, just starting to get black feathers, and displaying their flashy tails, even while grabbing a drink of water. Later in the week, Tom Ledford and others reported hundreds of Common Yellowthroats (a year-round resident in Florida, though the population changes as birds fly in and through from South America) along the coastal areas. There were still quite a few at the Maritime Hammock Sanctuary this week. 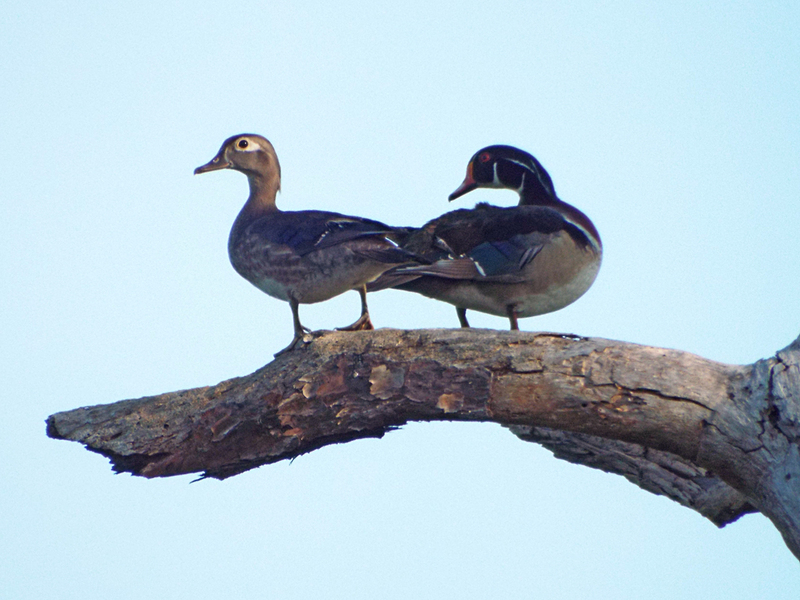 Some off-the-beaten-path birding was in the offing, too. Having heard reports of a Yellow-billed Cuckoo in the residential areas near Turkey Creek, Camille and I took a quick look into an area north of the park in hopes of seeing it. We struck out on the cuckoo, but wound up seeing a small mixed flock of warblers that included Chestnut-sided, Magnolia, and Yellow-throated Warblers. All this activity culminated in a surprise sighting for me this week. For the past few weeks, I’ve been part of a Kirtland’s Warbler survey, using eBird to try and get a better handle on the migratory habits and travels of this species. Just a couple of decades ago, the Kirtland’s Warbler was on the brink of extinction as its breeding grounds were disappearing. With a better understanding of what is needed to manage it (fire, as it turns out), the population is rebounding. 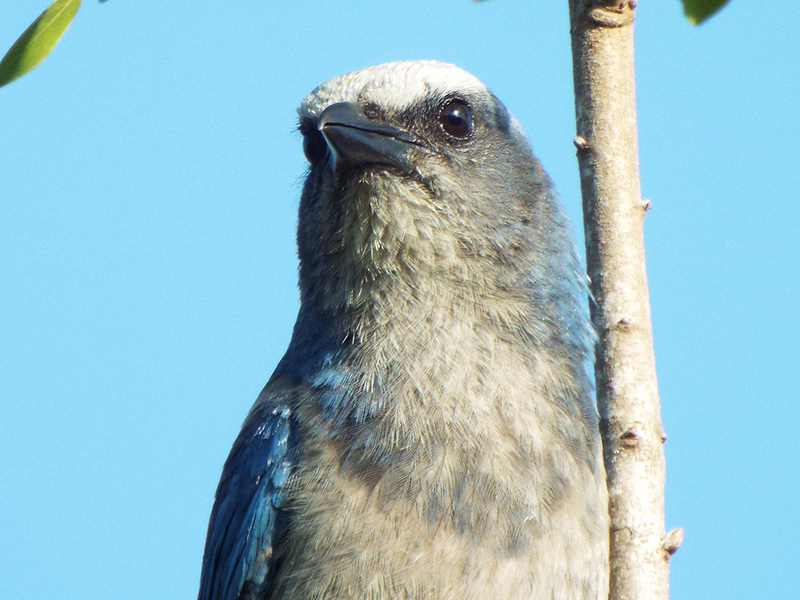 The entire population of this bird winters in the Bahamas, and we know where the birds should travel to get to their breeding grounds (Wisconsin, Michigan, and Ontario), but they are almost never seen en route. 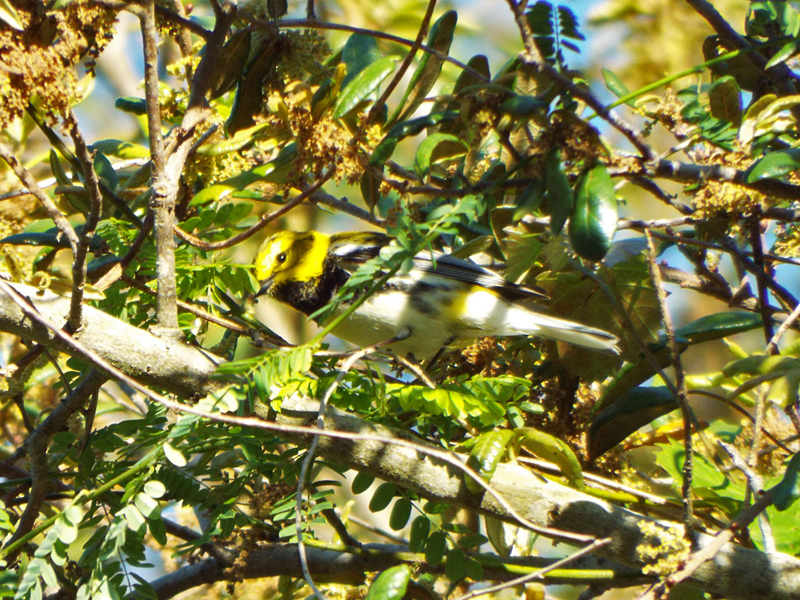 So far, the suggested survey points have not shown any Kirtland’s Warblers, and as the end of the survey period is approaching, I was resigned to the fact that I’d not be seeing this bird this year (or probably at all). While birding the Maritime Hammock Sanctuary, I so happened to turn to face some scrub vegetation near a pond while searching for a Great Crested Flycatcher I heard nearby, when out popped a Kirtland’s Warbler! It stayed well in the open for several seconds, even bobbing its tail several times (a trait the species shares with just a few other North American warblers). My photos, however, are not so grand. I was so shocked to see the bird that I watched it in stunned silence in binoculars before it occurred to me to take a photo. Maybe just enough to see the gray face and white eye-ring? Gray back with black streaks are a species fieldmark. I tried using the survey audio to call the bird back, but to no avail. As I’ve said, it is extremely rare to see this species in migration. I felt honored and privileged to get just a few precious seconds with this bird. 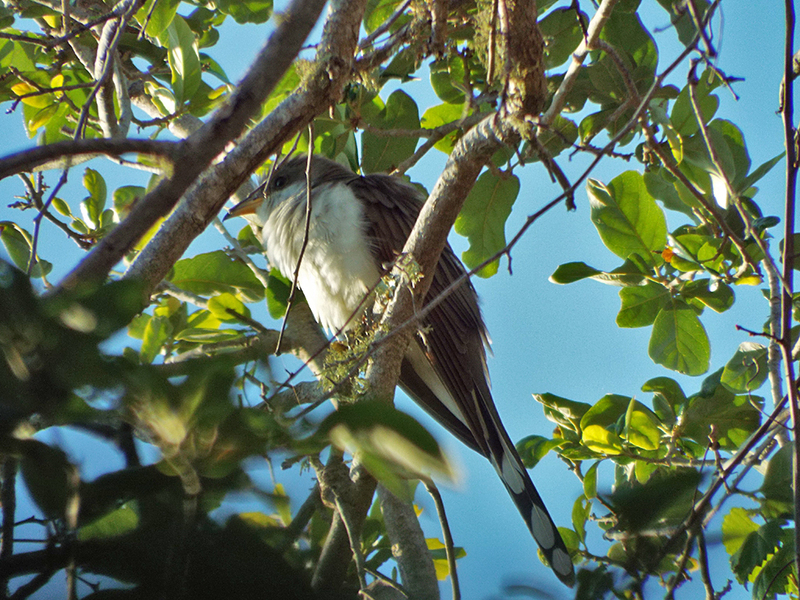 As a final note, I also finally got my Yellow-billed Cuckoo for the county this Spring. I’ve been sort of chasing this species for the last few weeks, with sightings reported just hours after a leaving a park. Sitting high in a tree, this Yellow-billed Cuckoo was also calling out, which is the first clear vocalization from this species I’ve heard since my early birding days in Massachusetts. Here are the various eBird lists, since April, documenting the Spring migration as it nears its end. There are sure to be a few more migrants coming through the rest of the month, but the bulk of the season is over. Strong southerly winds for much of the Spring probably caused most of the Hooded and Prothonotary Warblers (among others) to overshoot our area. And you know, that’s fine. The birds take advantage of any energy saving method to get them to their breeding ground in peak condition. If that means they overfly the parks around my home, I’m glad they made the safe journey. It’ll try to catch up with them in the Fall. Since my last entry we’ve had one small and one larger “fall out” of migrating birds here along the Space Coast. A fall out happens when birds encounter a weather event that forces them from flight to stop and seek shelter or food – or both – for a time before resuming their paths. Flying takes a tremendous amount of energy. Over a long period of time, many birds have developed methods to save that energy in flight. 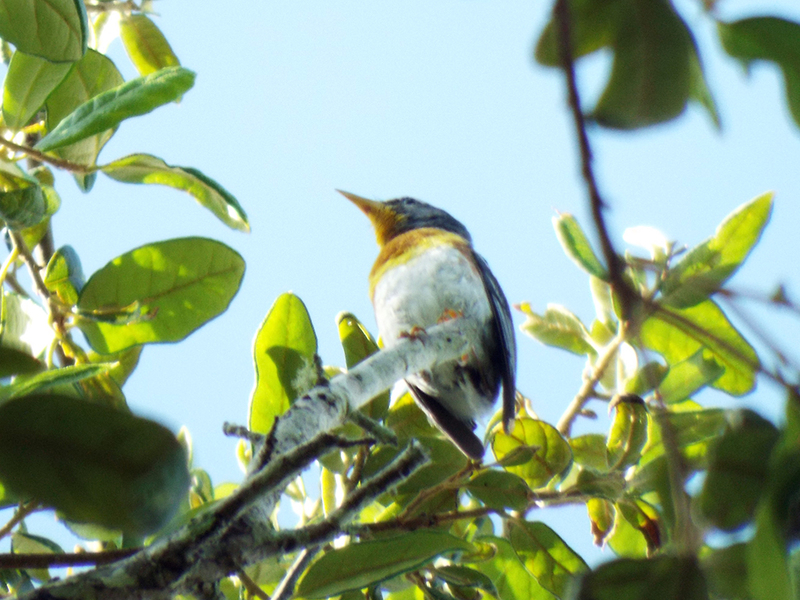 Neotropical migrants, like warblers, use approaching winds and weather fronts to time their overnight flights. For much of this spring there have been unusually strong southerly winds along the entire peninsula of Florida, allowing many migrants to fly very long distances with a tail-wind, often bypassing the state altogether. That has made for another fairly quiet migration, for the most part. At the beginning of April, a cold front did sweep across the state, and some early migrants were forced down into area hotspots. 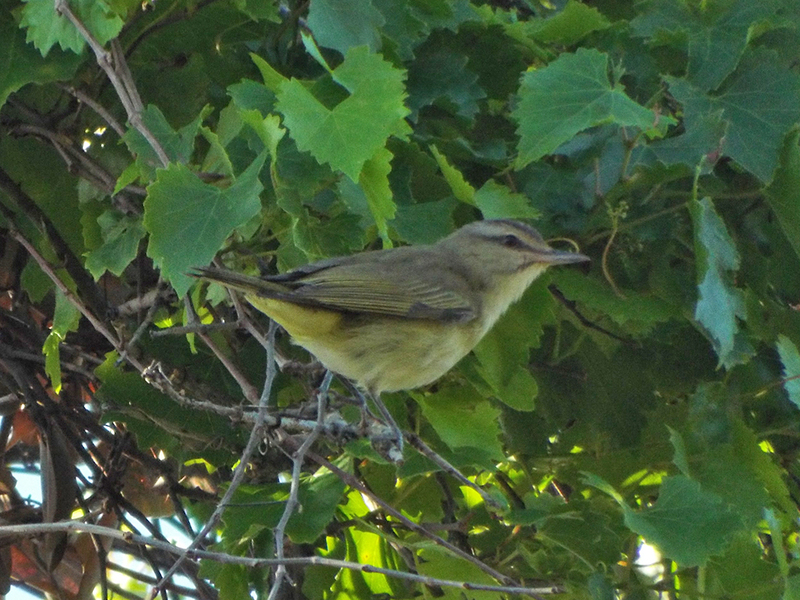 At Lori Wilson Park, that generated some excitement as a rare Black-whiskered Vireo stopped for a couple of weeks. This is likely the same bird that also stopped there last year, so it remembered the park as a safe haven and place to refuel. Like many recurring and rare visitors, this bird had a favorite hang-out in the park. 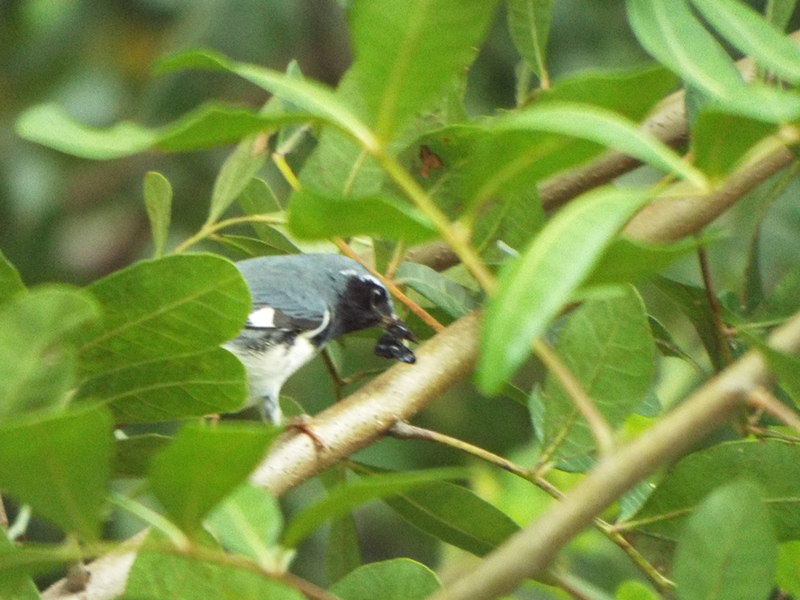 In this case a mature Gumbo Limbo tree, producing berries that vireos seem to love. 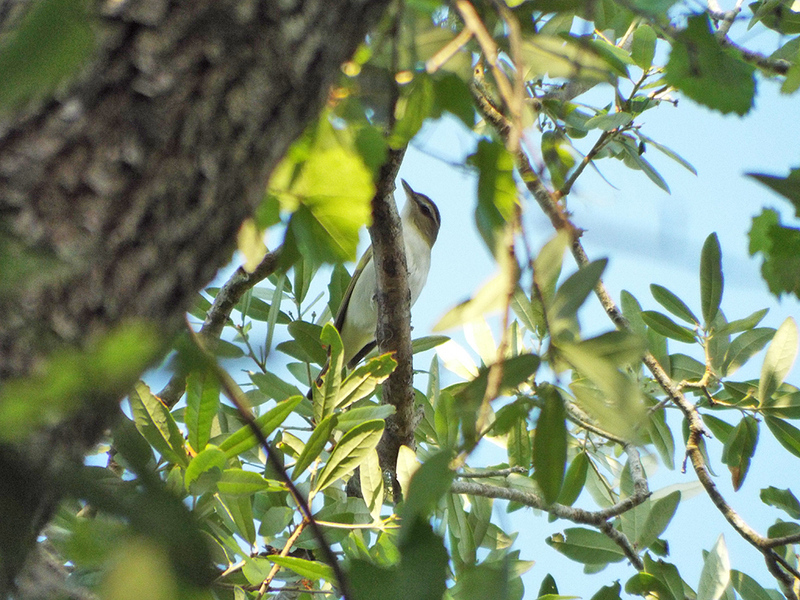 The season’s first Red-eyed Vireos were also present, as well as familiar faces that hadn’t found their favorable winds quite yet. 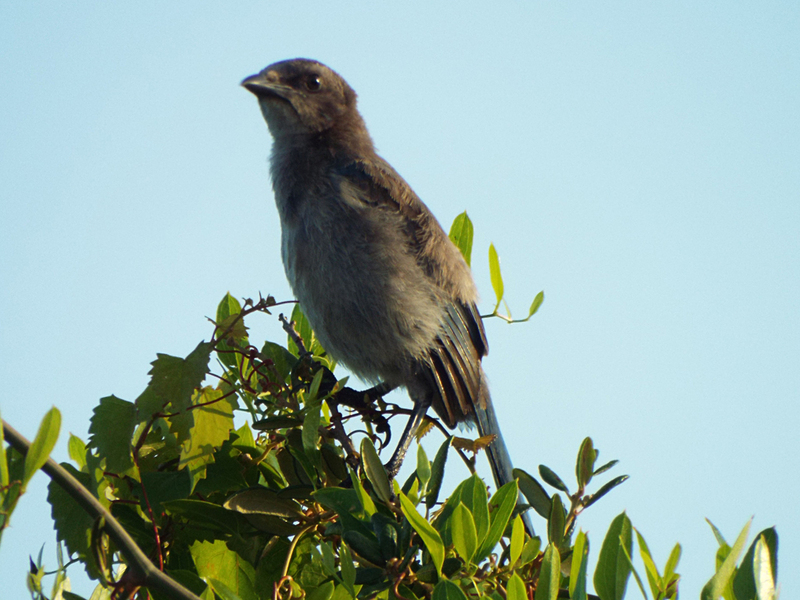 Prairie and Yellow-rumped Warblers were still there, as well as the park’s large contingent of Gray Catbirds. 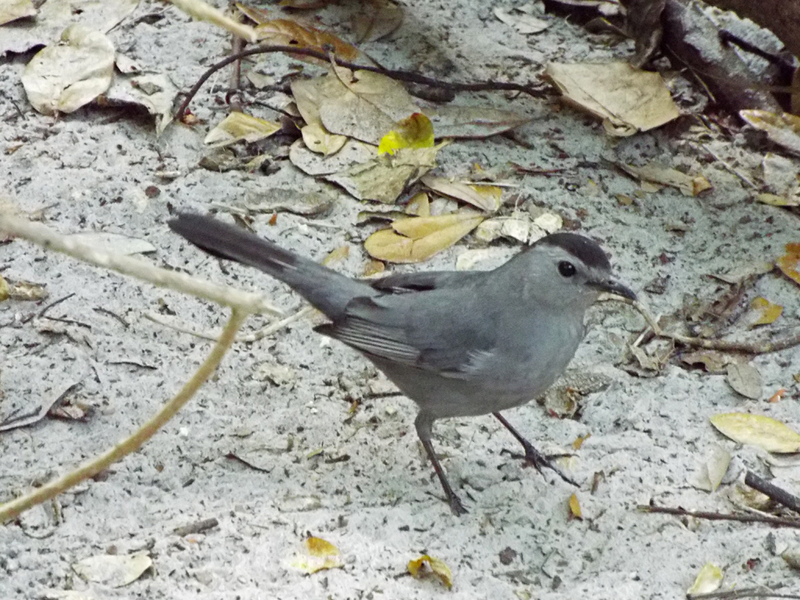 Catbirds generally prefer to skulk in the underbrush, but this bird had come out in the open to get some water. A complication this spring for any migrants that do need to stop and “top-up their tanks” is the lack of rainfall since the end of winter. Many places around the state are in drought and fire hazard warnings were up for much of the first part of April. The conditions only got worse as the month has worn on. 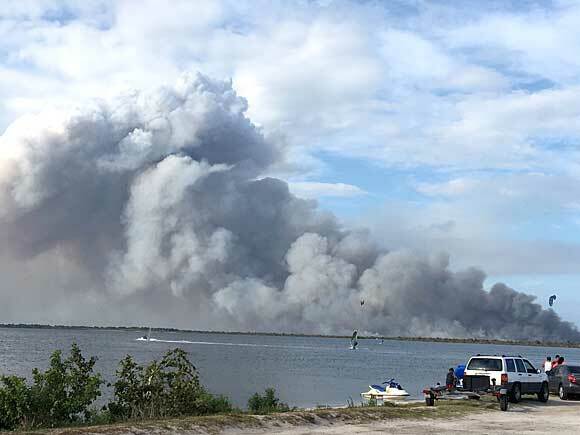 The marsh habitat of Black Point Wildlife Drive on Merritt Island caught fire last week and about 5,000 acres burned. 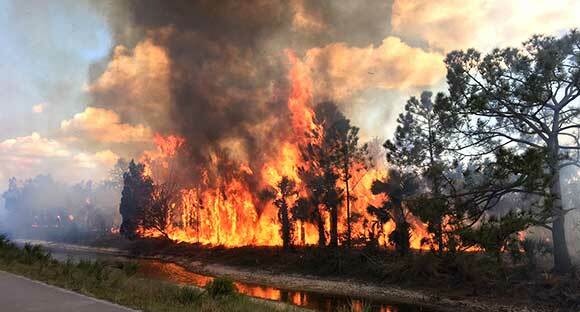 Fire is a natural and necessary force in shaping central Florida’s natural landscape, but only in area adapted for it. 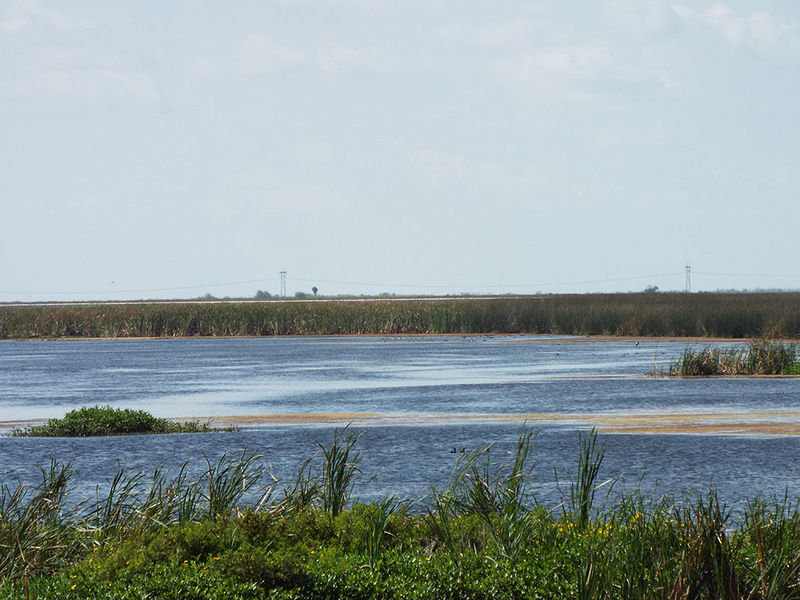 The area around Black Point is a wetlands habitat, dominated by mangroves. A hot burn there stands to do damage, even to the soil. It’s early days yet to know how much damage may have been done. The fire is suspected to be human induced, though the origin might never be truly known. If you smoke, please properly extinguish whatever you’re smoking and don’t light up when in areas prone to fire (which in recent days is just about anywhere outside). 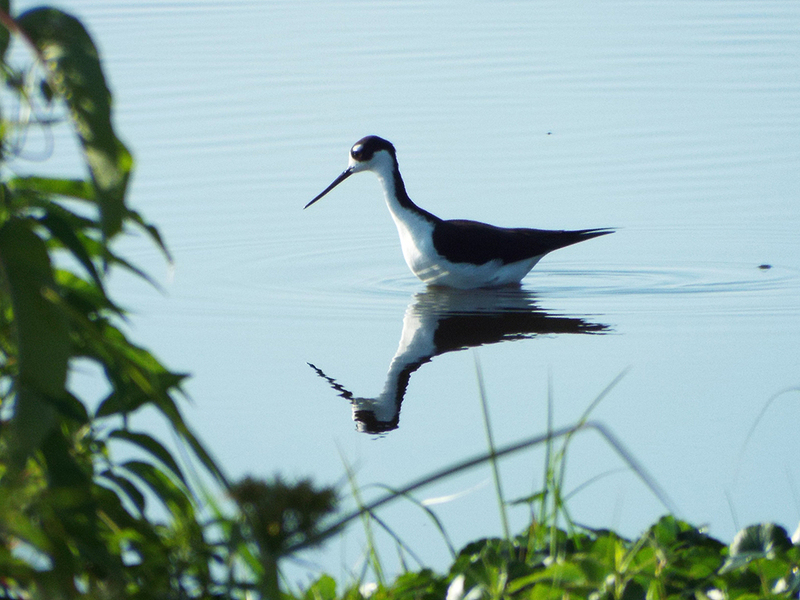 After the small fall out at the start of April, conditions returned to strong, southerly winds again, even through the Spring meeting of the Florida Ornithological Society. 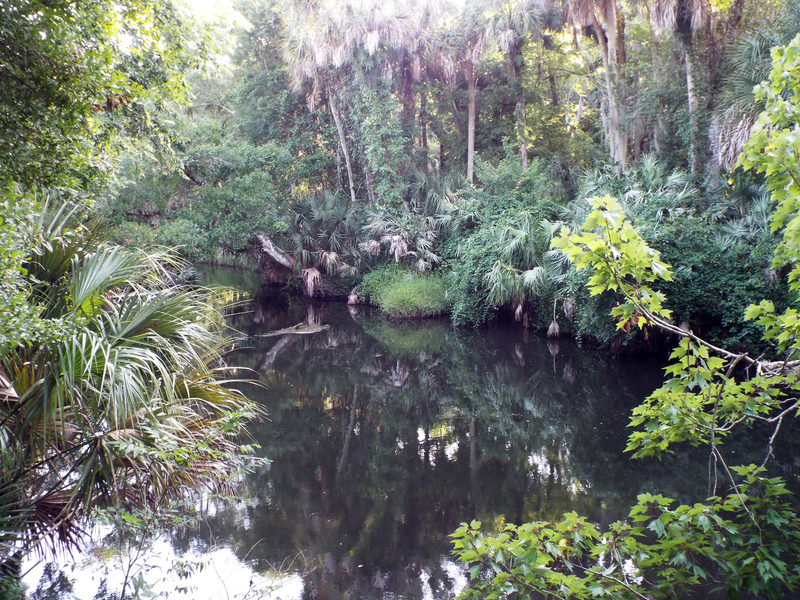 The FOS meeting was in Ruskin this year, near Tampa. I’ll have a little to say about that coming up in another blog entry. Finally, this weekend we had another front come through. Though not as strong as the one a couple of weeks ago, there were more birds in the sky as we’ve reached peak migration time for many species. The results were dramatic. 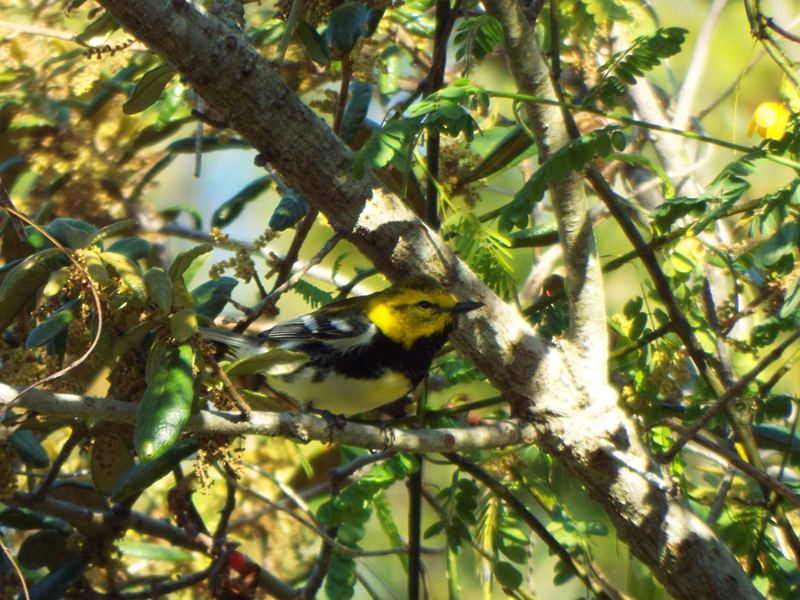 Over at Fort De Soto park (just days after I left the area after the FOS meeting), dozens of tanagers and grosbeaks descended on the park, though the warbler numbers were low. 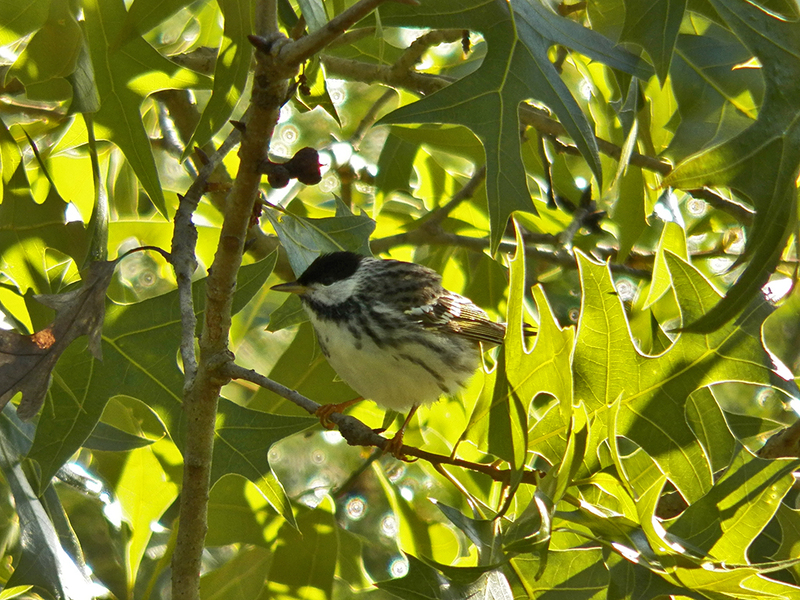 Closer to home, Turkey Creek Sanctuary finally saw its largest number of migrant warblers of the season. Over two days this week I went out before work to see what made pit stops there. Tuesday morning had large numbers of Black-and white Warblers on the move. This species winters in Florida, Mexico, Central America, and parts of South America. It breed throughout much of the eastern US and Canada. 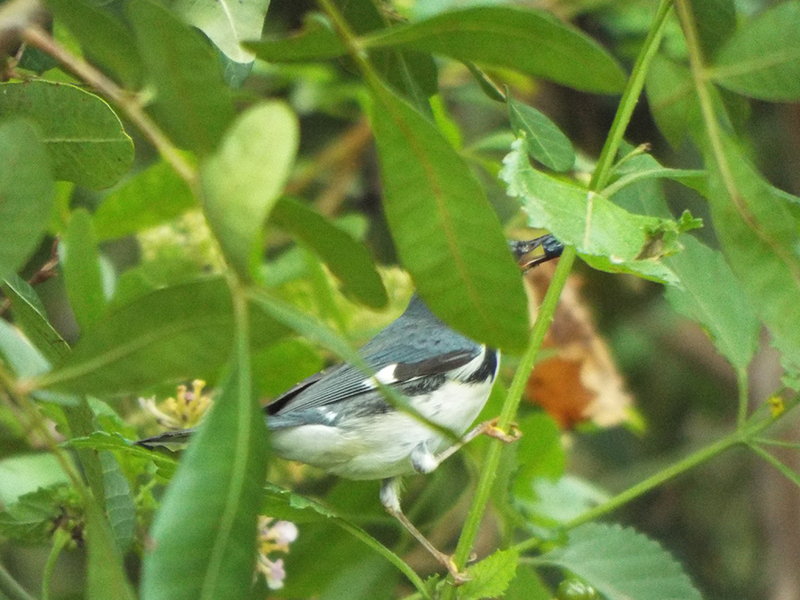 There were also Black-throated Blue Warblers, American Redstarts, and Blackpoll Warblers throughout Turkey Creek Sanctuary. Small numbers of Cape May and Worm-eating Warblers were also there, and at least one Black-throated Green Warbler – a long anticipated life bird for me! Finally! I’ve been hoping for this bird for a while. The extensive black throat feathers identify this Black-throated Green Warbler as a male. 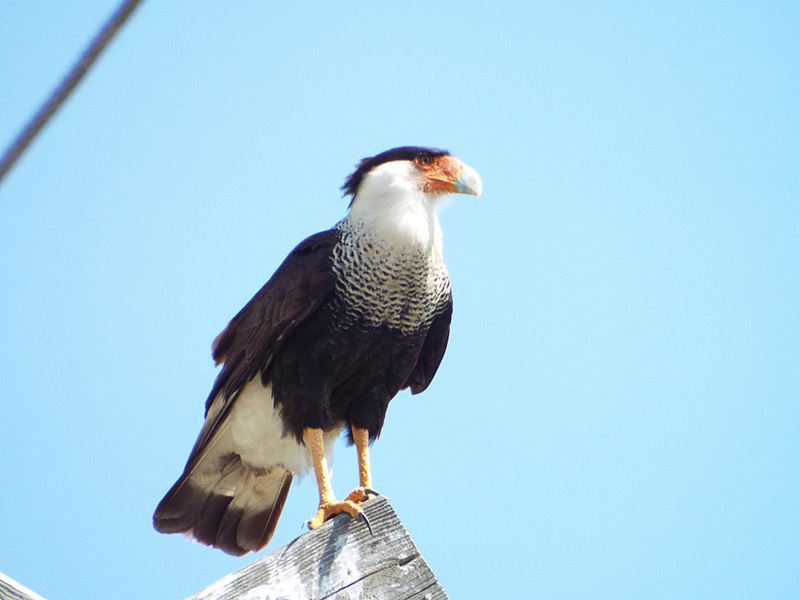 Many of the birds were moving west, out of the sanctuary and into the adjacent neighborhood. I think this might be because of the limited food supplies in the park itself. The native and ornamental trees in the neighborhood might be irrigated, thus producing more fruit and attracting more insects. The following morning saw much the same mix, except the predominate bird was the Blackpoll Warbler. 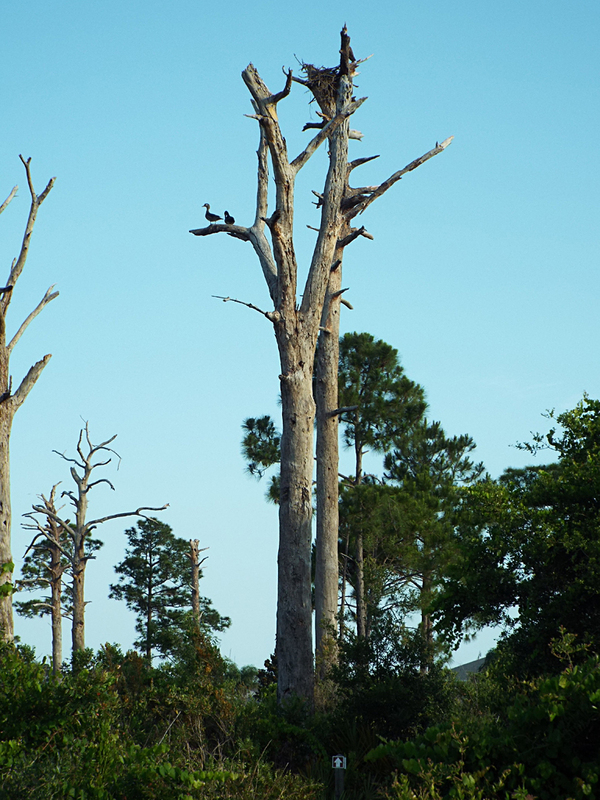 I saw at least 3 dozen, mostly males, throughout the entire southern part of the Sanctuary (the northern area – specifically the Sand Pine and Turkey Oak trails – remain closed as trees and debris are being cleared, due to last Fall’s hurricane Matthew. Here are three eBird lists from Monday, Tuesday, and Wednesday. I included Monday’s list for a comparison to what happened after the fall out conditions. Food supplies in the sanctuary are still low, but these birds are finding enough for at least a brief stopover. I expect things will taper off again as the winds are already turning more southerly. There are still a few weeks to go for migration, so hopefully there will be more chances for birds to make stops along the Space Coast. Many of these species won’t be seen here again until October. I know this entry is a little light in the photographs, but such is the way with small, fast moving targets. 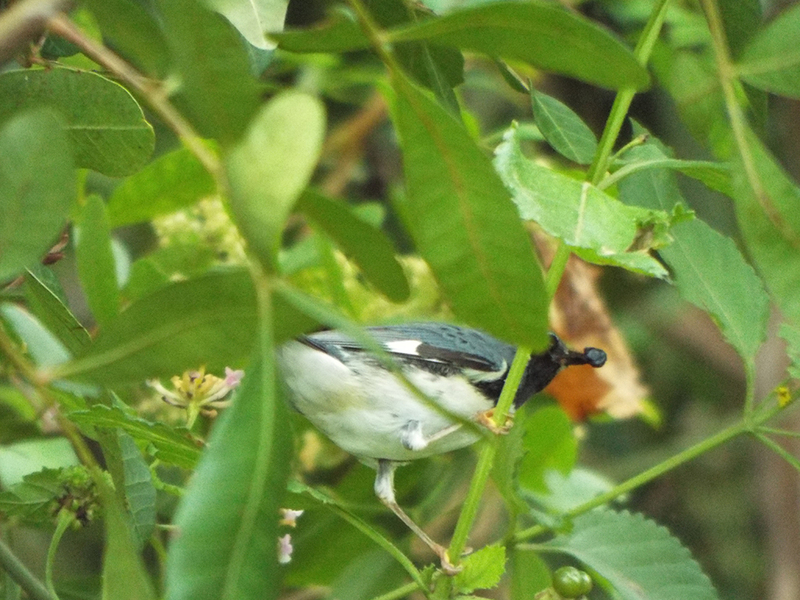 I was excited that my Black-throated Green Warbler was as accommodating as he was! Turkey Creek Sanctuary was closed most of last week, after Hurricane Matthew did some minor damage and left lots of debris along the boardwalk and trails. 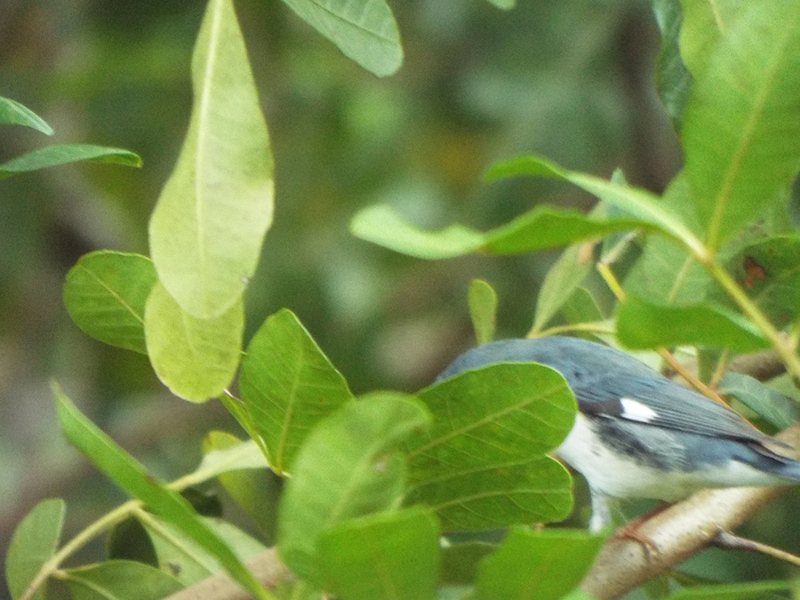 I walked the perimeter of the park before work one morning and got to play a little hide-and-seek with a male Black-throated Blue Warbler. Other highlights included a Merlin, a Sharp-shinned Hawk, and a Red-shouldered Hawk. 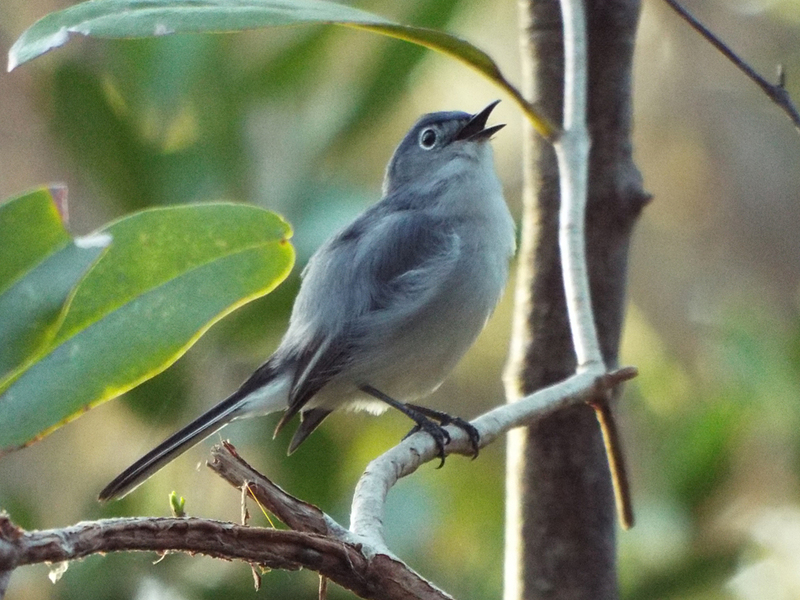 I also had my first Gray Catbirds of the season and some other surprises and expected comforts. Longer term readers of this blog know that Turkey Creek Sanctuary [map] had long been a mainstay of my weekly birding adventures. Of late, this beautiful part of the EEL family has been less than stellar, when it comes to watching birds. Migrations for the past two years have been exceedingly quiet and episodic. While visiting new places and teaching a newbie the “birding ropes”, it’s not been a priority location. This changed late last week after seeing the uptick in action and Lori Wilson Park (another quiet-of-late Space Coast migrant spot). 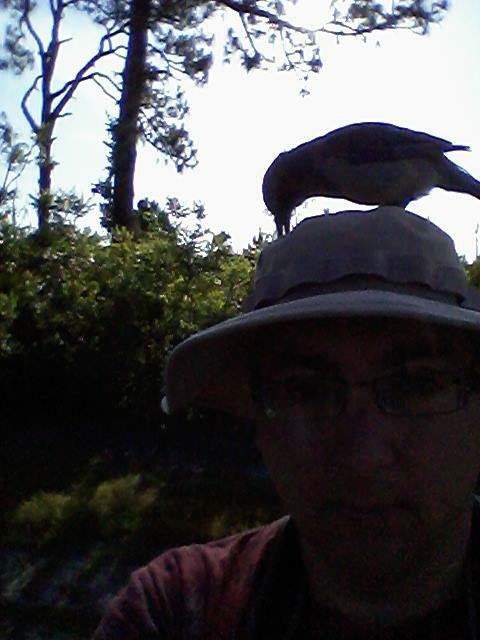 I saw on the Brdbrain e-mail list that Bill Haddad had some decent species numbers at Turkey Creek, and was leading a Space Coast Audubon Society walk there on Saturday morning. We’d had a “good” shift in weather, and Bill was banking on seeing more migrant warbler (and other species). 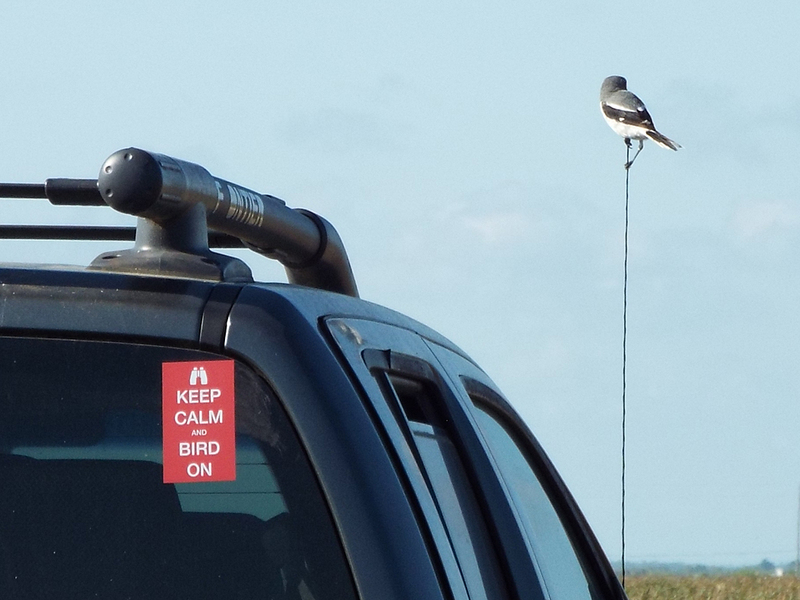 I decided to drop in on his walk and see what my birding fortunes would be. I am glad I made the trip. While we didn’t have a “blockbuster” morning by any measure, it was nice to see some bonafide migrant species and enjoy a day that, while starting off a bit drizzly, wound up blue and beautiful. The only metaphorical “fly in the ointment” was the wind, which likely kept the numbers and species count down. But for Turkey Creek it was a nice change, and I got to walk the comfortable and familiar paths of my old stomping grounds. We used the tried-and-true method of locating common and vocal resident species, such as Northern Cardinals and Blue-gray Gnatcatchers to find associated migrants. The tail-end of a Blue-gray Gnatcatcher. All the birds we saw were so active, photography was not often a fruitful endeavor. At the end of one overlook (I can’t remember if it was the “Tree House” overlook or not), a juvenile Red-shouldered Hawk landed in some nearby (but obscuring) oak limbs to devour it’s lunch (a frog). Best-focused and least graphic photo I have of the hawk having a fresh meal. Of course, spring time is in full swing, and much of our canopy is closed in, which made locating the many Northern Parulas we heard a frustrating exercise. Even later on, with other warblers and vireos singing quite close by, we had to rely on the group’s combined birding-by-ear expertise to positively identify the birds. 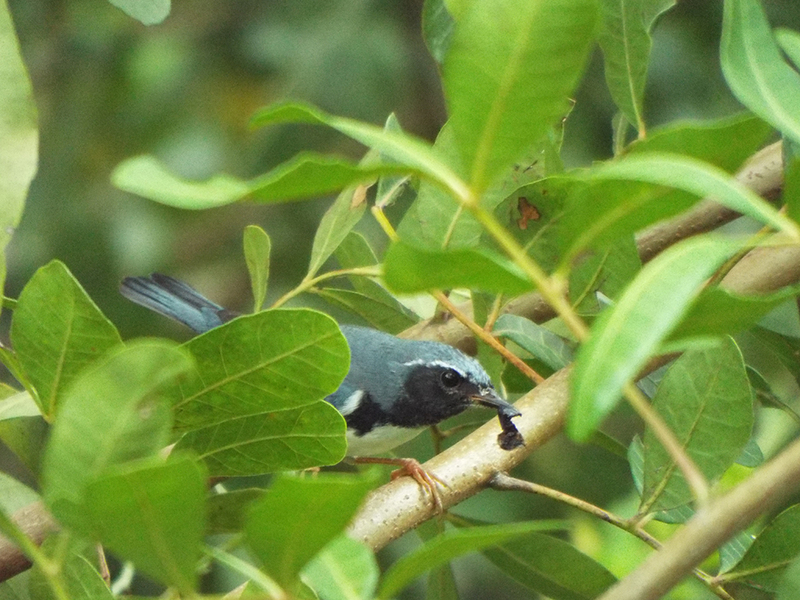 Among the FOY birds for me this trip were Black-throated Blue, Worm-eating, and Cape May warblers. Various airplants and bromeliads are still blooming, like this +2-foot diameters plant with the bright red inflorescence. I was tempted to ID it as a Cardinal Airplant, but the inflorescence looked different to me. If anyone knows the specific species, I’d be glad to know – just leave a comment. This may be the largest airplant I’ve seen, outside of the Everglades. We had some non-avian friends as well. A pretty orange butterfly landed on the path from McKinnon’s way to the jogging path. When it finally landed, it refused to open it’s wings (at least until after I left the vicinity – other’s ID’d it for us). American Painted Lady butterfly, resting. 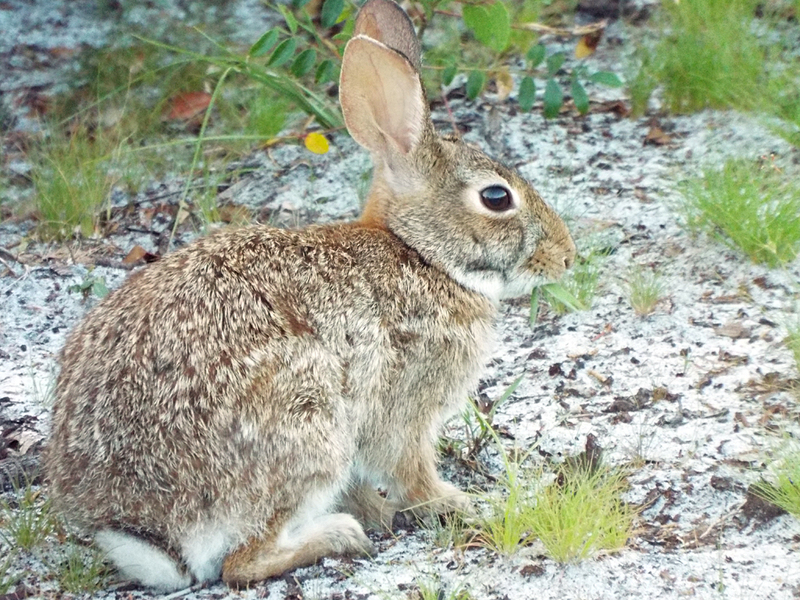 No trip to Turkey Creek Sanctuary is complete without a Gopher Tortoise sighting, of course. This one was just off the boardwalk on the way toward the park entrance. Gopher Tortoise hanging out on the equivalent of its front porch. By the end of the walk, only a few of the 10 of us remained (it was a taxing walk, with little reward at first), and we were treated to a couple of male Indigo Buntings in the sanctuary and public library parking lot. At the very end just Bill and I were left as two Swallow-tailed Kites flew quickly past over us in the lot before the breeze quickly carried them away. This may bode for some good migrant activity through the week until the weather changes again, and I hope some birders have a chance to get out there and appreciate these birds as they make their way north, in some cases thousands of miles, to their breeding grounds. It’s been quite a few weeks since I checked in at the Turkey Creek Sanctuary. Although I wasn’t expecting too much, it was nice to take in the familiar sights and sounds of the place. I arrived just after sunrise and managed to do the majority of the jogging trail, the boardwalk and the Sand Pine Trail in about three hours. The Sanctuary doing its best to look primeval. I also used this as an opportunity to count birds for my first “official” eBird checklist. I’ve been reluctant to make any checklists on eBird for a variety of reasons. For one, when there are larger numbers of individuals of a species, especially if they are encountered at various points though a hike, I don’t trust my count. I used to carry a notebook around and that might certainly help, but I find that I sometimes get too caught up in following a bird or watching what it’s doing, then I would forget to count the numbers. I realize that seems a bit lame, but I did make it a goal this year to start making an effort to use eBird. I counted quite a number of Northern Cardinals, which is not surprising – this park is usually overrun with them. I tracked a few Northern Parulas both on the boardwalk and on McKinnon’s Way, and finally managed to get sight of one high in the canopy. I wasn’t sure what I was seeing, at first, until I realized the bird had no tail feathers! Whether this was from parasites, molting, or an attack by a predator, I have no way of knowing, but he was singing and foraging like all was well, otherwise. There was little else to document, apart from some woodpeckers and Carolina Wrens scattered here and there. The highest concentration of birdlife was near the canal and weir. There were Blue Jays (one of which was imitating a Red-shouldered Hawk so well that it got a hawk to answer its calls from across the canal), Fish Crows, Mourning Doves, and White-eyed Vireos along the jogging path before the weir. At the canal itself there was an assemblage of birds just behind the floating barrier. 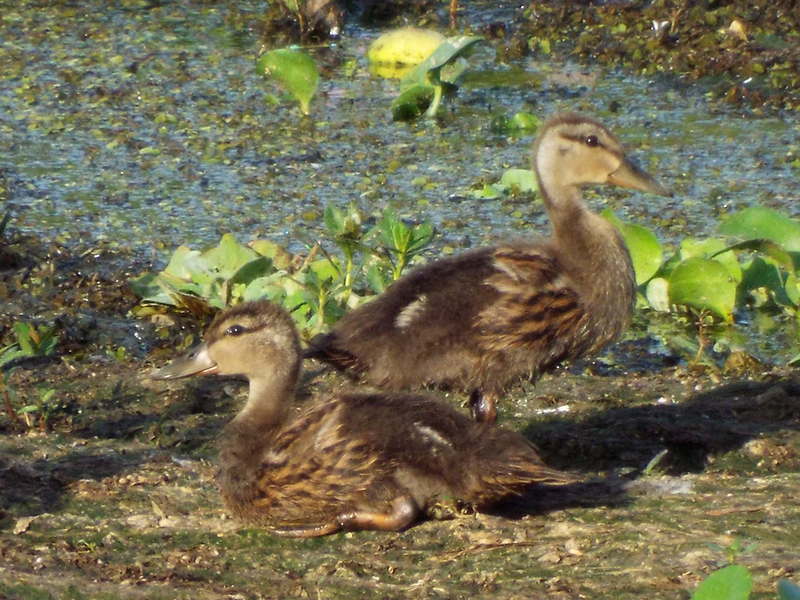 Two of four Mottled Duck juveniles (I think they are past the “chick” stage here) that were resting with 2 adults. 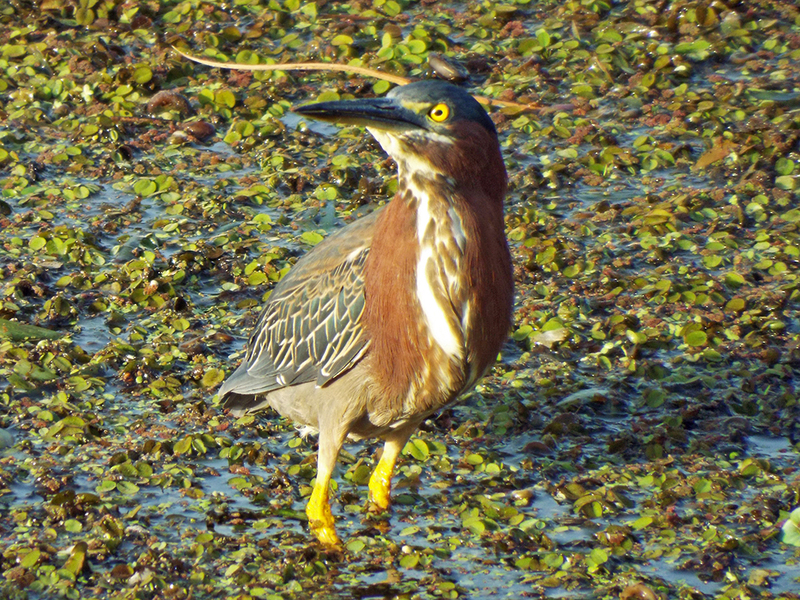 Along with Mottled Ducks and a few American Coots and Common Gallinules, there were two Green Herons and Two Killdeer probing the mud and vegetation. I was a little surprised not to see any other herons or egrets near the canal. 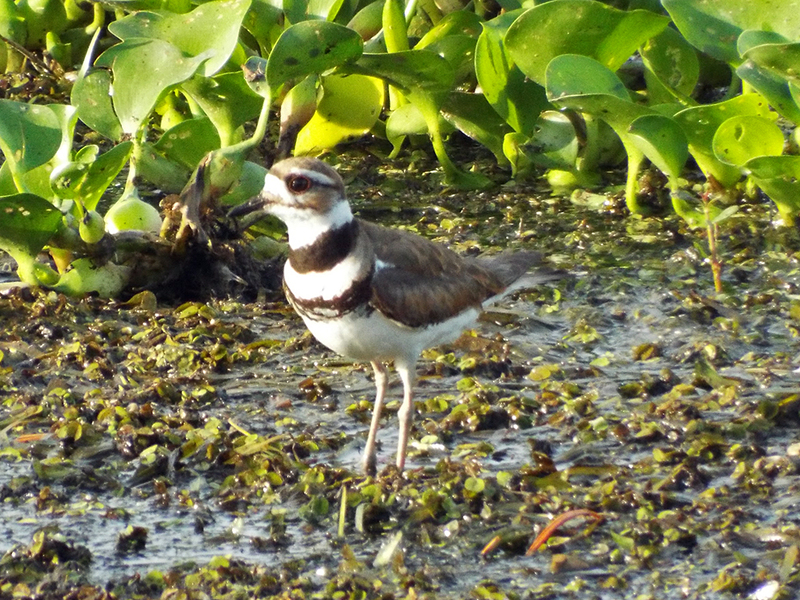 I expect the situation at Turkey Creek will be fairly stable for the next month or so, with some of the breeding birds raising their young and some fledglings venturing out. Some of the early migration vanguard will start to arrive later in August, but until then things should remain quiet.